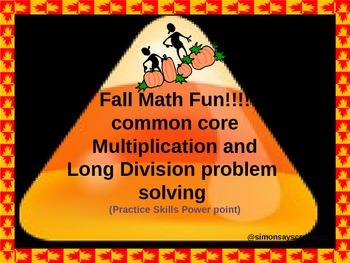 Use this fabulous Common Core Math Fall Fun power point to practice basic upper elementary school grades multiplication and long division skills through word problem solving. There are 20 word problems in this power point. This power point focuses on multiplication of 1 and 2 digit by 2 and 3 digit numbers, and long division with both 1 and 2 digit divisors. There are no remainders in this activity. 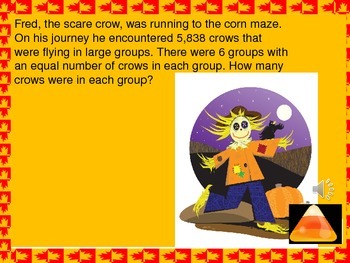 Answers are placed under the candy corn at the bottom of each page. This is Fall themed, and there are fall pictures and clipart throughout. This activity can be used as a whole group, small group, or a center activity. I use mine as a warm up activity at the beginning of class. The children work out the problem at their seats, while volunteers come up to the board to use their problem solving strategies to solve. This activity will work on any smart board that allows power point. I use mine on my Promethean Board, and the kids love it! I have placed a media sound component on many of the pages for your students’ entertainment. I have them click on it if they get the answer correct. It makes practicing math computation and problem solving skills a little more fun for the children. Enjoy!